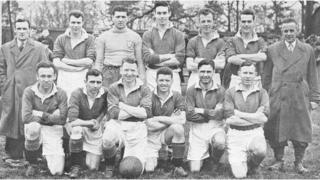 Rare footage of junior side Dundela's famous win over Glenavon in the 1955 Irish Cup final which was played on 23 April at Windsor Park in Belfast. Dundela opened the scoring in the 21st minute when Davy Kavanagh played in Bobby Ervine who coolly lifted the ball over the Glenavon goalkeeper. Ervine netted his second of the game in the 85th minute and Jackie Greenwood capped the victory with Dundela's third goal two minutes before the end.